As the lead listing specialist for The Peters Company, I’m very grateful to be selling homes in a seller’s market. This means there are more buyers than sellers (AKA, low inventory! ), and that means more exposure for our clients’ homes. However, it doesn’t necessarily mean it’s any easier! The truth is that no matter the market, a listing agent must sell your home THREE times (even if it only goes under contract once). Yep, you read that right… keep reading to understand the three parties we must sell your house to to get it to the closing table! The first person we sell your home to is a real estate agent! You see, 92% of buyers find properties through their agent, so it’s very important to expose your listing to as many agents as possible. We do this through the MLS services, and at The Peters Company we take it a step further by reverse prospecting (targeting agents with clients whose search criteria matches your home), circle prospecting (targeting the top 20% of agents in your area and sending the listing directly to them), advertising on private Facebook groups with thousands of agents, and hosting agent caravans. Agents understand the value of a home better than a buyer, so pricing is very important to getting an agent on board. A smart agent will wait to show an overpriced property or will advise their buyer to make an offer that reflects the market vs the list price. The next person we sell the home to is the buyer. This usually has more to do with emotion than logic, so professional staging, gorgeous photos, and the “feel” of the property is very important. When a buyer feels comfortable in a home, they act and make a decision to make an offer. The more the buyer can picture themselves in your home, the better! The in-home experience is very important and added touches such as our Home Information Book and Feature Cards help up our chances of a buyer choosing your home! Finally, we have to sell the home to the appraiser. Any buyer getting a loan (about 80% of transactions) will be required by their lender to have an appraisal performed on the home. A third party appraiser visits the property while the buyer is under contract. Looking only at facts/figures (read – no “emotion”/no cosmetic items) the appraiser determines the value of the home. The appraisal must support the sales price in order for the buyer to move forward with the closing – if it doesn’t, the contract must be renegotiated. In the case of a low appraisal, the buyer can walk away from the transaction at no penalty, and the home goes back on the market – ready to face another appraisal down the line. 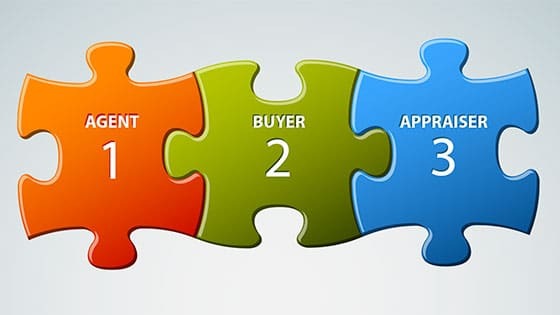 When we price, market, and sell homes we take all THREE of these parties into consideration. Want to learn more about the value of your home and how we are able to help? Email us anytime at listings@thepeterscompany.com for a free home evaluation and consult!